Which Echometer instrument provides the most beneficial features for our company’s needs? 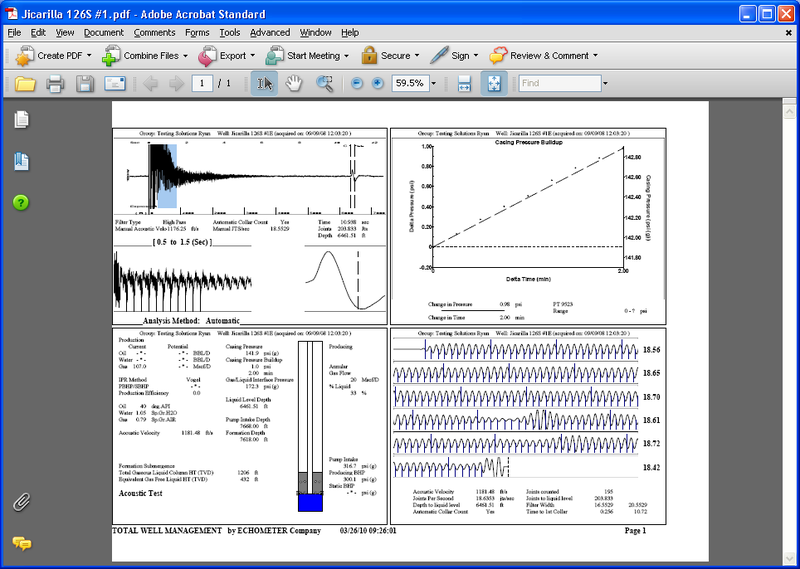 How does the computerized Well Analyzer compare to the Model M strip chart acoustic liquid level instrument? To learn more about how Well Analyzer compares to the Model M, click here. I have a Well Analyzer with pressure transient capabilities, but TWM is not allowing me to access any pressure transient data. 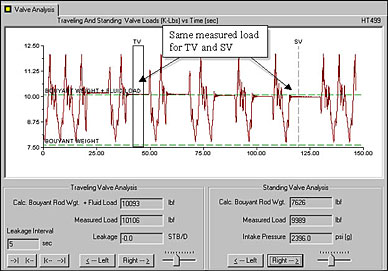 How do I view my pressure transient data in TWM? In order to view the pressure transient data in TWM, it is necessary to enable the Pressure Transient Test module. 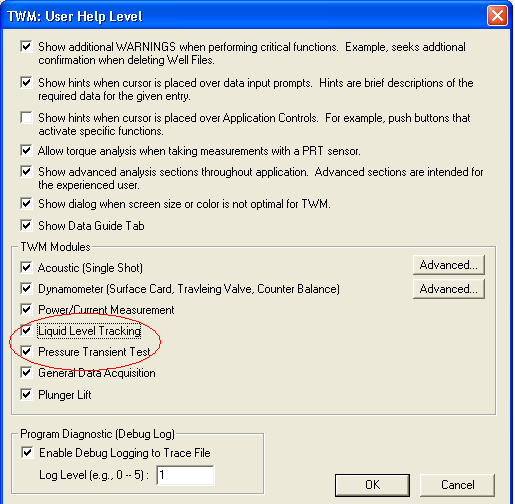 Follow these steps to ensure pressure transient functions have been enabled. During normal operation, the Well Analyzer is connected to the Remote Fire Gas Gun by two cables. The larger multi-conductor cable supplies power to the pressure transducer and receives electrical signals from the pressure and temperature sensors. In addition, the larger cable supplies 12-volt power to the electrical solenoid for approximately 1 second to actuate the solenoid. The solenoid should actuate and cause a gas valve to open and allow gas to escape from the gas gun volume chamber into the well. If a question exists about the gas gun generating a sharp acoustic pulse, shoot the gas gun into the atmosphere and verify that the gas gun is operating properly. A definite gas pulse explosion should be heard when the gas gun is charged to 500 PSI, then fired into the atmosphere. The gas gun may need to be cleaned and lubricated before the gas gun will generate a good pulse. The internal gas valve must be lubricated for smooth and proper operation. The acoustic pulse generated by the gas gun should be released into the well through a full opening 2" conduit for best results. The distance between the gun and the well should be less than 5 feet for optimum results. The acoustic pulse should be strong for optimum performance. Normally, the gas gun volume chamber is charged to 200 PSI in excess of well pressure for the initial test. More or less gas pressure can be used after satisfactory results are obtained with either more or less pressure. The gas gun microphone detects the shot when the gas pulse "hits" the microphone disks. 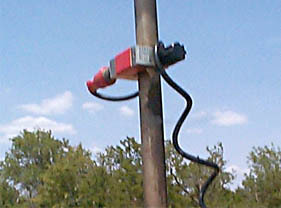 This large pressure pulse generates a large electrical signal that indicates that the shot pulse has been generated and has started traveling down the well. 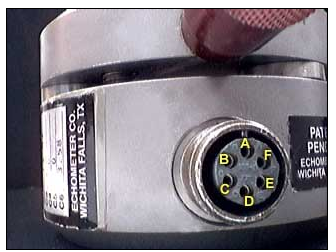 The signal from the microphone travels through the electrical connector on the gun, through the 90-degree swivel connector on the gun (if present) and through the single conductor cable to the Well Analyzer. The biggest cause of non-detection of the initial shot pulse is non-continuity of the wiring between the microphone and the Well Analyzer. Inspect all electrical fittings and the cable to insure that the wiring is continuous between the microphone and the Well Analyzer. 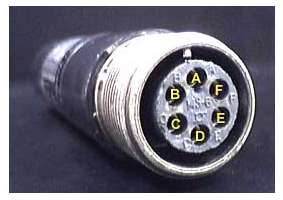 The inner contacts on the cable and other fittings must be in good shape. Most of the contacts are gold plated, but the contacts must be clean for electrical continuity. Clean with alcohol or a good contact cleaner if needed. 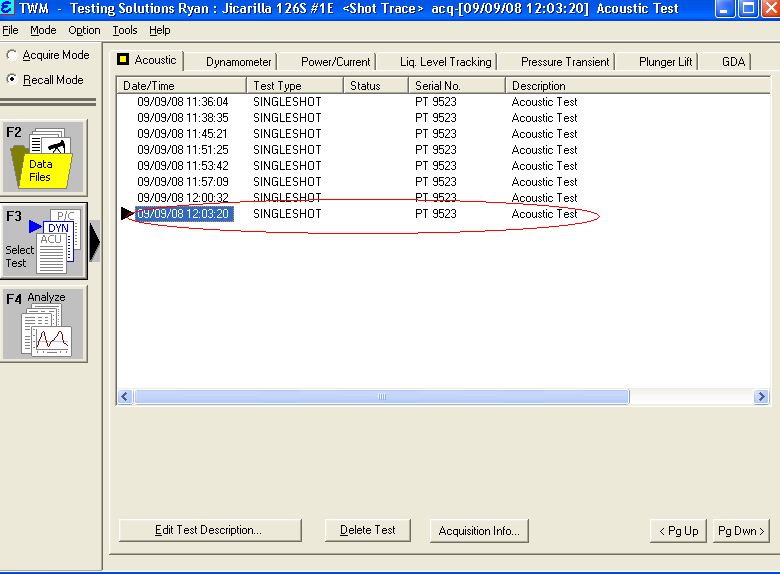 The operator can view the acoustic background noise in the well before the gas gun acoustic pulse is generated to determine liquid level depth. If the electrical connection is proper between the gas gun microphone and the Well Analyzer, a tap on the gas gun will cause a response in the acoustic trace. This is verification that electrical continuity exists between the microphone and the Well Analyzer. How do I copy TWM files from my Well Analyzer laptop to my desk computer? The easiest way to transfer data, especially complete data sets and groups, from one computer to another is to copy the data from the C:\TWM files on your hard drive to a USB flash drive, and then physically transfer the data to the next computer. Follow the detailed steps below, or click on the following link for a PDF version that can be printed out. If you have any further questions, please contact Echometer Company for further assistance. I recommend that you use a USB memory stick to copy the files onto. I would recommend that you buy at least a 2 gig USB drive, if you do not already have one. Start the lap top that has the TWM Data on that you want to copy. Allow windows to startup. Install the USB disk drive into a USB port on your computer. 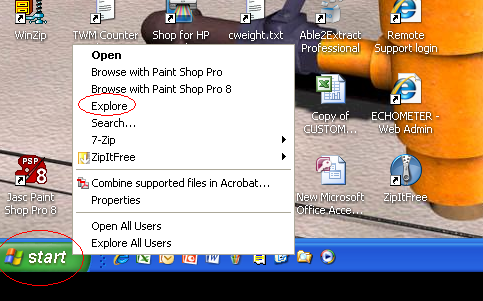 Take your mouse pointer and move it to the bottom left corner of the computer desktop and place it on START. Click the right mouse button and a utility box will open up. From this utility box place your mouse pointer on Explore and click the left mouse button. A Start Menu Box will open. From this box browse for the local (C:) Drive. 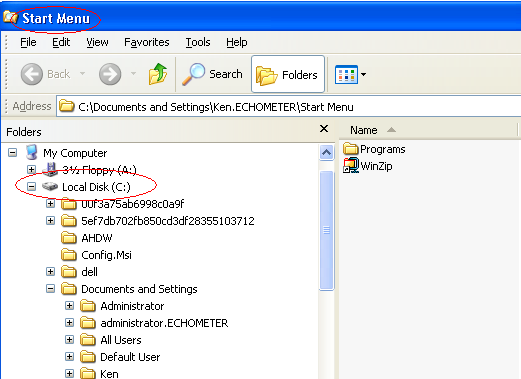 Place your mouse pointer on the Local Disk C: and click the left mouse button. 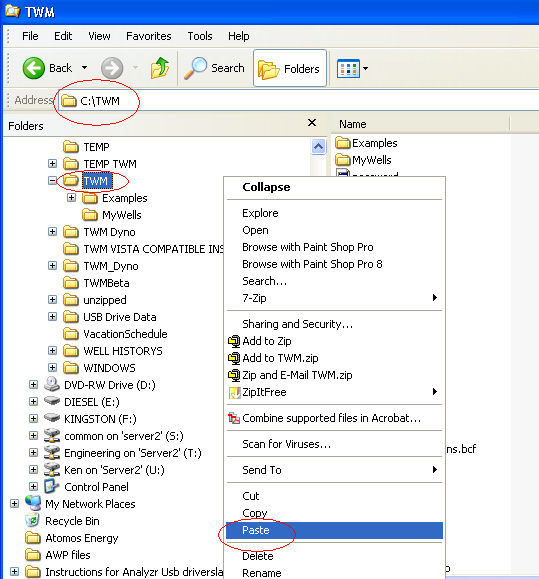 Browse for the C:\TWM Folder on your PC by placing your mouse pointer on the button in the center of the gray up down slide bar in center of the box move the slide bar down till you see the TWM folder. Place your mouse pointer on TWM Folder and click the Left mouse button. The C:\TWM folder will open. 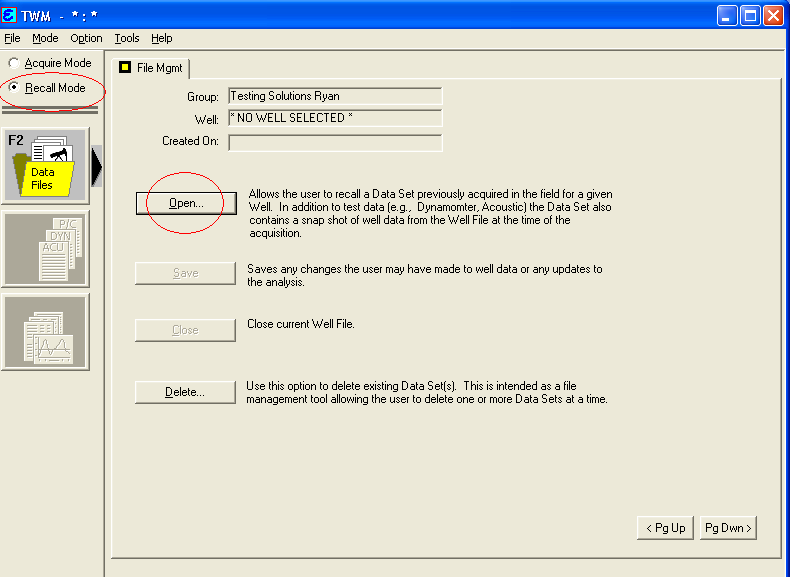 Locate the sub folders you created in TWM that contain your well data. To copy these sub folders. Hold down the Ctrl key on your keyboard (Keep this Ctrl key press down while selecting the folders that you want to copy). Keep selecting the subfolders that you want, as you click the left mouse button, they will turn blue when you have the ones you want to copy selected. Click on the right mouse button and a utility box will open. From the utility box place your mouse pointer on copy and click the left mouse button. This copies the sub folders and the data in the subfolders to a clip board. Browse the left side of this screen and place your mouse pointer on the USB Drive. In this example it is Diesel (E:) While your mouse pointer is on the USB Drive. Click the right mouse button and a utility box will open. Place your mouse pointer on paste and click the left mouse button. This will paste the sub folders onto the USB drive. 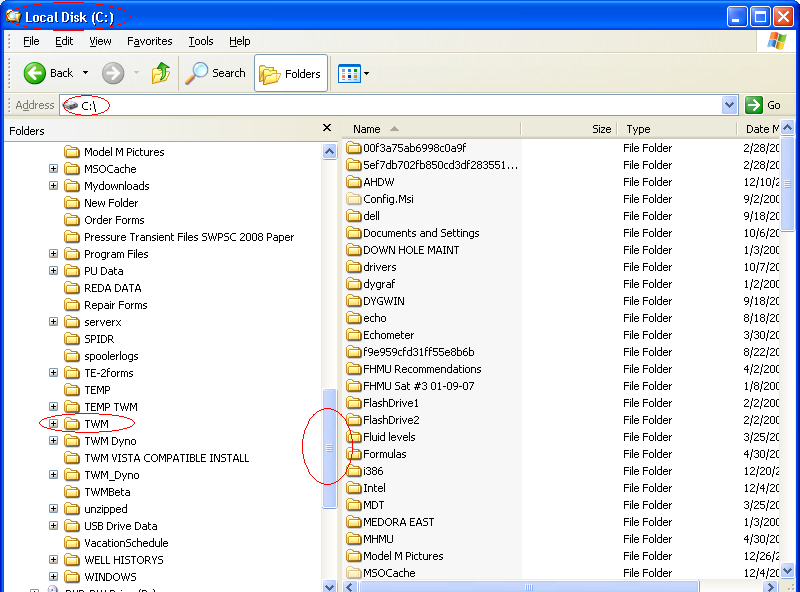 The Subfolders with the data in them has now been copied to the USB Drive. Start the lap top that you want to copy the TWM data onto. Allow windows to startup. Install the USB disk drive into a USB port on this computer. Browse for the USB (E:) by placing your mouse pointer on the button in the center of the gray up down slide bar in center of the box move the slide bar down till you see the (E:) Drive. Place your mouse pointer on (E:) Drive and click the Left mouse button. Take your index finger of your left hand and hold down the Ctrl key on your keyboard (Keep this Ctrl key press down while selecting the folders that you want to copy). Keep selecting the subfolders that you want, as you click the left mouse button, they will turn blue when you have the ones you want to copy selected. Click on the right mouse button and a utility box will open. From the utility box place your mouse pointer on copy and click the left mouse button. This copies the sub folders and the data in the subfolders to a clip board. Browse for the C:\TWM. Place your mouse pointer on the TWM folder and click on the right mouse button. A utility box will open. Place your mouse pointer on Paste and click the left mouse button. 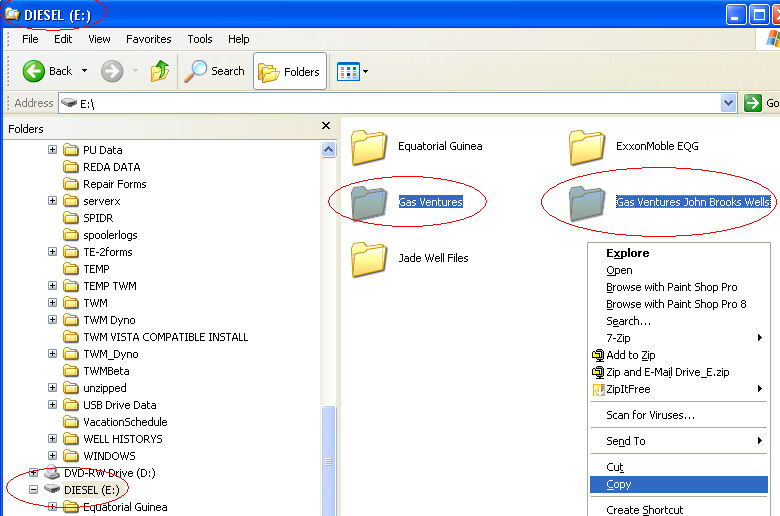 This copies the Sub folders with your TWM data into the C:\TWM Folder. How do I email files from TWM? Start TWM and go to recall mode then click on the open button. 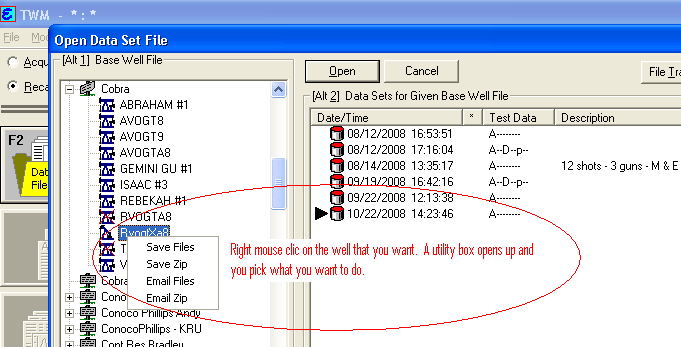 Place your mouse over the well that you want and click the right mouse button. 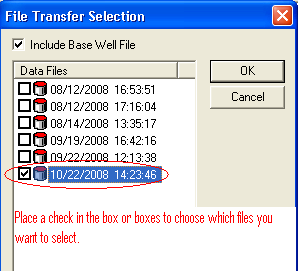 This will bring up a utility box, Choose e-mail files from this box and a file transfer box will open up. From this box, select the file or files you want to e-mail and click OK button. After clicking ok, if you have Microsoft outlook set up on your computer, Outlook will open up with the files you selected attached to a new message. You will then type the persons e-mail address into the to box and hit the send button. 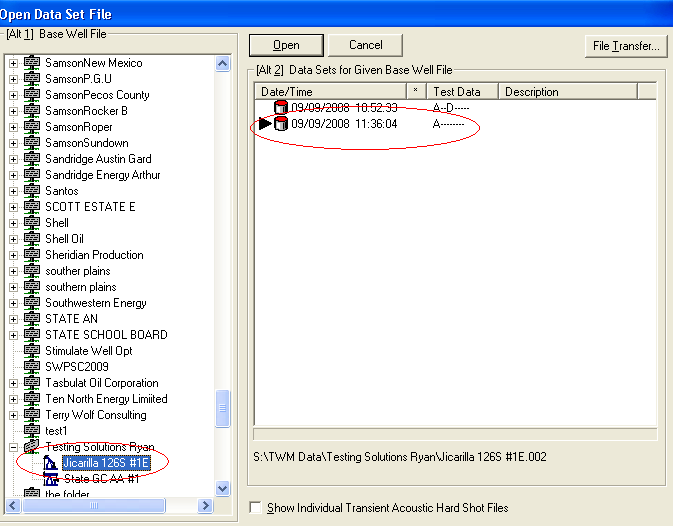 How can I turn a TWM Shot Trace report into a PDF file? 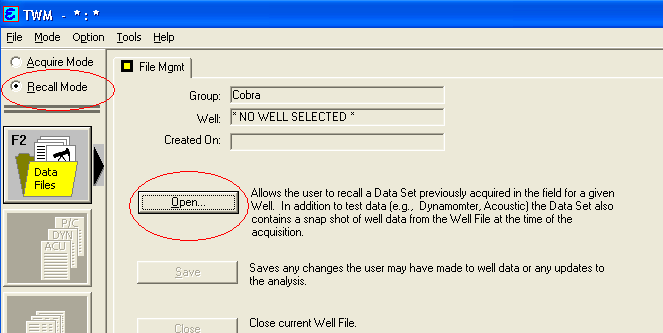 Start TWM in the Recall Mode and from File Mgmt click Open. 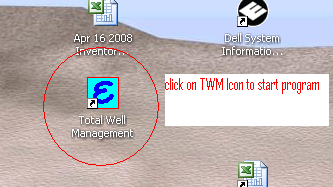 Find the Folder the well is in and click on the well. Select the data set. From File Mgmt click on F3 Select Test. From the menu. Select file and then select print. 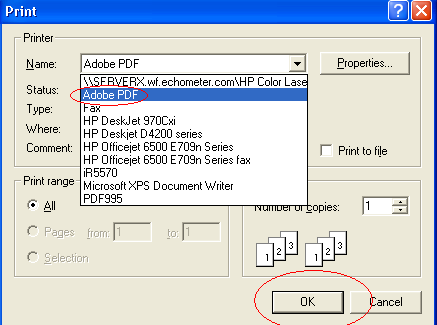 From the pull down box, select Adobe PDF, then click OK.
Save the file to a location. 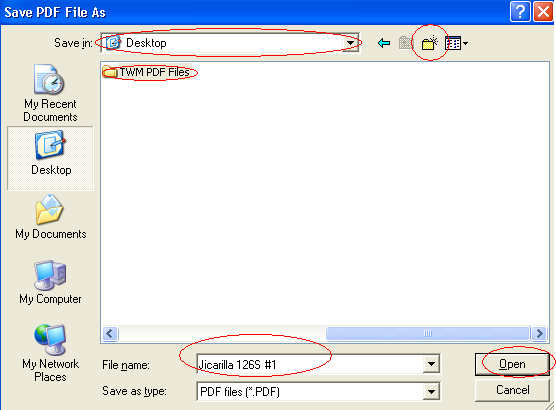 In this example, the file is saved to the desktop under a TWM PDF folder. 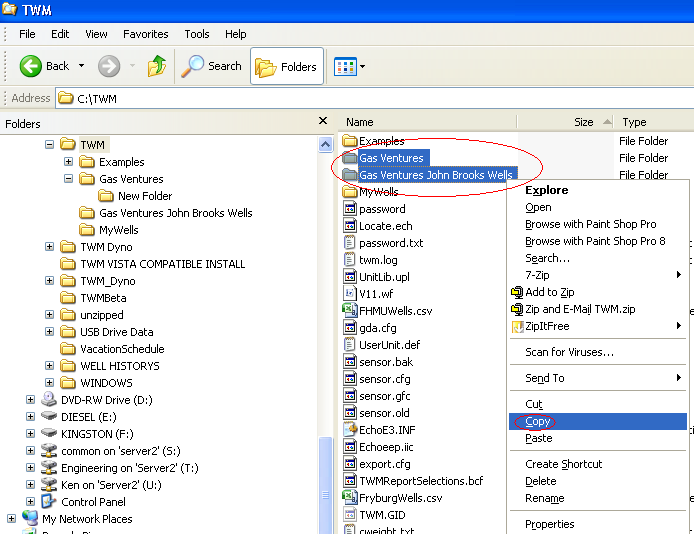 Type the name of the well as the file name then click open. This saves the file to the desktop. This is the PDF file that is created. Note: If you do not have a PDF writer listed in your printer options, there are a number websites that offer a free PDF writer download. They are simple to install and will automatically set up the Adobe PDF option in your printer file. Two sites that we have recommended and used are: www.primopdf.com and www.pdf995.com. My Well Analyzer is set up for Pressure Transient capabilities, but I can't find any pressure transient tabs in TWM. 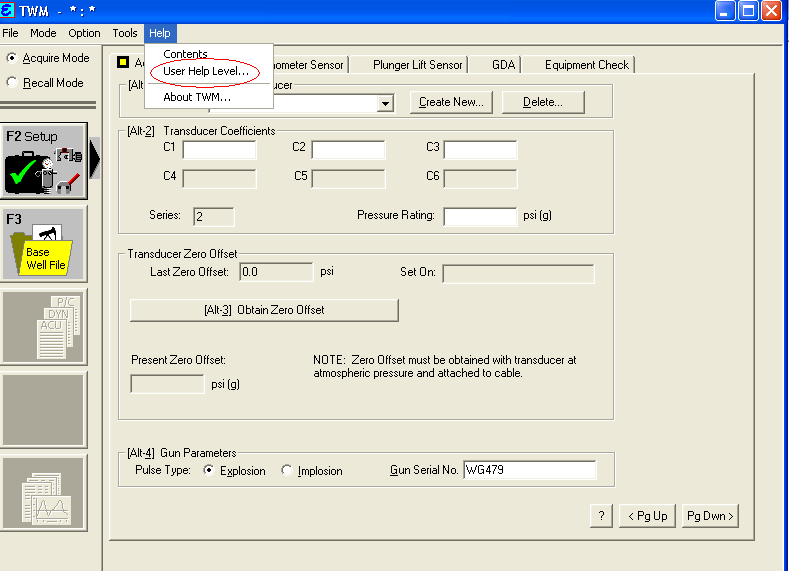 If you have upgraded your Well Analyzer features to include Pressure Transient, Plunger Lift or Liquid Level Tracking, it may be necessary to activate these features in TWM. The following steps take the user through activating Pressure Transient specifically, but the steps will work for activating any of the features. Keep in mind that even though the features have been activated in TWM, you cannot acquire Pressure Transient or Plunger Lift data unless these features have been installed on the Well Analyzer. Start TWM from the Desktop. After TWM starts go to the top menu bar and click on help and user help level. Make sure there is a check mark in the boxes for Pressure Transient and for Liquid Level Tracking. Now make sure the USB cable from the Well Analyzer is plugged into the computer USB port. 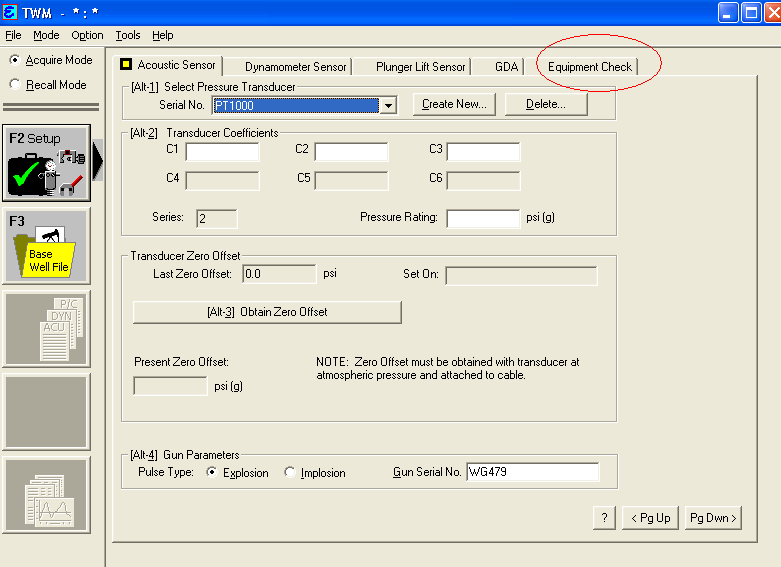 Turn on the Well Analyzer and go to the Equipment Check Tab. 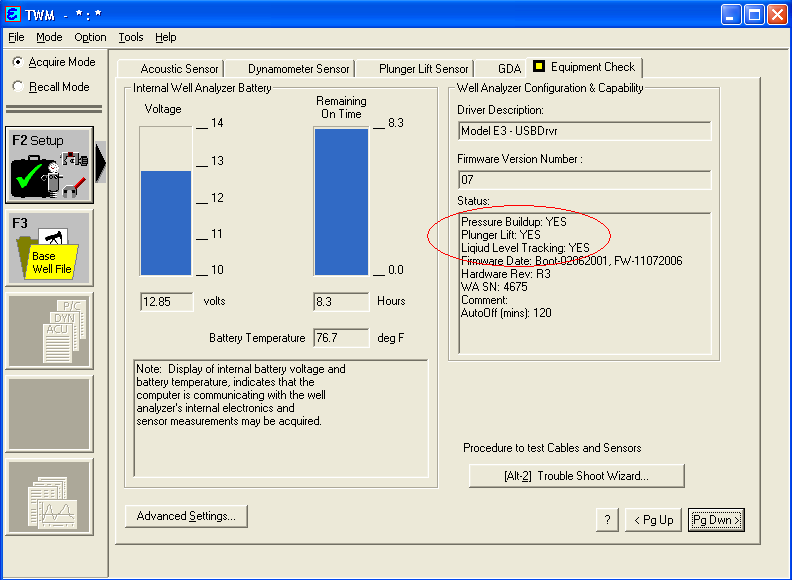 On the middle right side under the section titled Status, make sure the word YES appears next to Pressure Transient and Liquid Level Tracking. 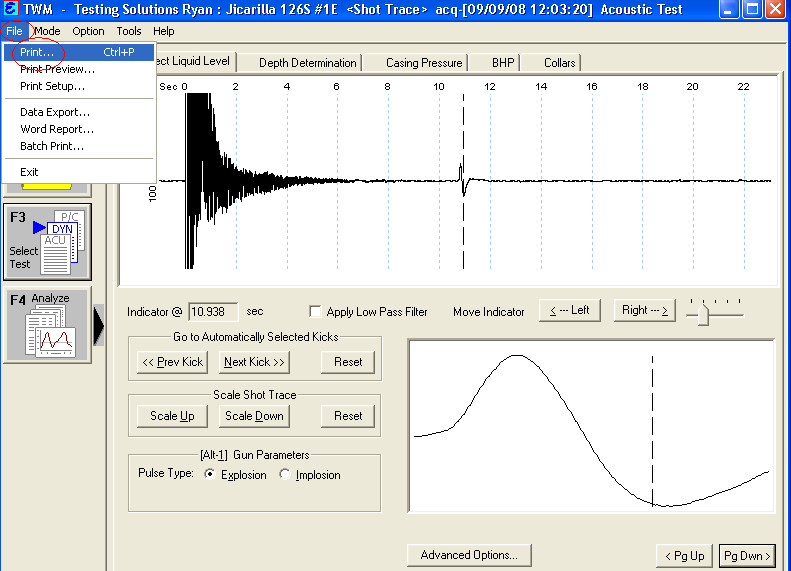 How does an explosion acoustic pulse differ from an implosion acoustic pulse? An acoustic pulse can be generated at the surface of a well by rapidly adding gas to the casing annulus or by rapidly removing gas from the casing annulus. A gas gun volume chamber can be charged to a pressure in excess of the casing pressure, and this gas can be rapidly released into the casing annulus to generate an acoustic pulse that is a compression wave. An acoustic pulse will also be generated when a volume chamber is attached to the casing annulus, and pressurized gas from the casing annulus is allowed to rapidly discharge (implode) into the lower-pressure volume chamber which will cause a negative (rarefaction) pulse in the casing annulus gas. The casing pressure should be 100 PSI or more to get satisfactory results in the implosion mode. At low pressures, an external gas supply must be used to pressurize the gas gun volume chamber to a pressure of approximately 100 to 500 PSI in excess of well pressure. Typically, the gas gun volume chambers are 10 to 20 cubic inches in size. Deeper, low-pressure wells require a larger initial acoustic pulse. Larger volume chambers and higher gas pressures in the volume chambers will result in larger liquid level reflections. Normally, the casing pressure must be 100 PSI or greater before gas can be released from the casing annulus into a volume chamber to create the initial pressure pulse. The valve should be opened rapidly. This negative or rarefaction pulse will travel through the casing annulus gas and reflect from the collars and liquid level and other anomalies just as the compression pulse that was generated by releasing gas into the casing annulus. At higher pressures, the release of gas from the well into the volume chamber or the implosion mode is much preferred because an external gas supply is not required. The acoustic pulse speed or velocity generated by a compression wave or a rarefaction (or implosion) wave is the same. The velocity of the acoustic pulse is a function of the composition, temperature and pressure of the casing gas. It is not related to the size of the pulse or whether the pulse is a compression or rarefaction wave. What can be done to reduce maintenance on the Remote Fire Gas Gun? The gas gun volume chamber should be charged to a pressure in excess of well pressure with CO2 or nitrogen gas to close the gas valve and prevent well gasses and debris from the well being blown into the gas gun volume chamber. After the remote fire gas gun is placed on the well, charge the gas gun volume chamber to a pressure in excess of well pressure before opening the casing valve. This will close the gas valve and prevent debris from being blown into the gas gun mechanism. Also, most well gases contain water vapor. This water vapor will be blown into the gas gun volume chamber if the gas valve is not closed by pressure in the volume chamber in excess of the well pressure. This water will cause corrosion and rust that will further contaminate the mechanism. For more information, see Preventative Maintenance for the Remote Fire Gas Gun. What are some considerations to keep in mind when using gas to generate an acoustic pulse from a gas gun? For considerations and general information on our acoustic gas guns visit our Gas Gun Information Page. Why can't I pressurize the Remote Fire Gas Gun volume chamber? The Remote Fire Gas Gun utilizes a solenoid and small dart valve to actuate a larger gas valve. If the small dart valve becomes dirty from well debris or sand, the dart valve will leak and the gun will fail to operate properly. The small orifice and dart valve must be kept clean or considerable maintenance will be required. The required maintenance consists of disassembling the Remote Fire Gas Gun dart valve and solenoid parts and cleaning them, then reassembling the parts. The maintenance of the Remote Fire Gas Gun can be greatly reduced by pressurizing the remote fire gas gun volume chamber before the volume chamber before the gas gun is exposed to well pressure. This prevents well gas and debris from entering the gas gun volume chamber. If the Remote Fire Gas Gun is not charged, water vapor, debris and sand from the well will be discharged into the small parts of the gas gun and will result in leakage and improper operation. This debris and water vapor can be eliminated from the small moving parts by simply charging the Remote Fire Gas Gun volume chamber to a pressure of approximately 200 PSI in excess of well pressure before the gas gun is installed on the well and the valve to the well is opened. Always pressurize the gas gun volume chamber to a pressure approximately 200 PSI in excess of well pressure before opening the casing annulus valve to reduce maintenance requirements of the Remote Fire Gas Gun. Does oil or water hurt the microphone? The microphone is constructed from stainless steel and has a Mylar plastic coating. Almost all hydrocarbon oils and water will not damage the outside of the microphone. If any oil or water leak inside the microphone, the microphone will be damaged. Some wells are chemically treated at the surface for corrosion. High concentrations of some chemicals are corrosive and will cause corrosion to the stainless steel Echometer gas gun parts. If the wells to be acoustically tested are chemically treated at the surface, the Echometer gas gun should be cleaned at the end of each day because the chemical may be corrosive to gas gun parts. To clean the gas gun: 1) Pressurize the gas gun, 2) Use a hydrocarbon solvent, soapy water, alcohol or electric degreaser to clean the portion of the gas gun that is exposed to well gases. Allow parts to drip dry or blow dry with compressed gas. Why is the Remote Fire Gas Gun not generating a pulse? The Remote Fire Gas Gun utilizes a solenoid. Power supplied from the electronic instruments actuates the solenoid. The voltage output can be checked with a voltmeter across the two pins on the cable connector which attaches to the solenoid connector. The continuity of the solenoid coil can be checked using a resistance meter. If the voltage is satisfactory, the problem must be mechanical. The solenoid coil raises a plunger that contains a dart valve. The plunger housing can be removed and cleaned. Also inspect that the plunger is free moving. If debris has collected in the gas gun, the orifice may be restricted or dirty and the gun will fail to operate properly. This requires that the gun be disassembled, cleaned, and reassembled. Always pressurize the gas gun volume chamber before the Remote Fire Gas Gun is exposed to well pressure. The well pressure will blow debris into the small parts of the Remote Fire Gas Gun if the volume chamber is not charged before being exposed to well pressure. This charging will greatly reduce maintenance. The Remote Fire Gas Gun volume chamber should normally be pressurized to 200 PSI in excess of well pressure. The gas gun, when energized, should supply a gas pulse which travels through the casing annulus gas and reflects from the collars and the liquid level. The pulse should reflect from all collars and the liquid level. An optimum acoustic data set would consist of collar reflections from the surface to the liquid level with a distinct liquid level reflection. Acoustic collar response from the surface all the way to the liquid level is not required since the computerized Well Analyzer will filter the acoustic data and extrapolate from known collar responses down to the liquid level. However, the measured liquid level depth is more accurate when a maximum number of collar reflections are obtained. The minimum acceptable acoustic data set would give a few collars and a liquid level response. In general, the more pressure used in the gas gun volume chamber, the further down the well the collar response is recorded so that a more distinct liquid level will be obtained. However, if satisfactory results can be obtained with less gas pressure in the volume chamber, gas can be conserved by using less pressure in the gas gun volume chamber. The collar and liquid level response from CO2 or nitrogen gas is very similar. The pressure in a fully charged CO2 container is limited to 1000 PSI at 80°F. Nitrogen gas can be used to charge the gas gun volume chamber to higher pressures if the nitrogen cylinder is fully charged. The limiting pressure on the remote fire gas gun is 1500 PSI at normal operating conditions. Do not exceed the ratings of pressure gauges, pressure transducers, or any other parts. How is the Remote Fire Gas Gun lubricated? The Remote Fire Gas Gun has a solenoid valve which actuates and opens a small nylon dart valve. When the small dart valve is open or leaking, gas is released from the small 1/8" hole located beside the pressure gauge. When gas is bled from this opening, the 1/2" gas valve opens and gas is released from the gas gun volume chamber through a 3/8" orifice into the well. The 1/2" gas valve contains two o-rings which must be lubricated. One o-ring is on the 1/2" outer diameter of the gas valve, and the other o-ring seals into the 3/8" orifice. Charge the Remote Fire Gas Gun to approximately 200 PSI. Use the Well Analyzer to fire the gas gun. It should create a distinct sharp pulse. When the Remote Fire Gas Gun in fired, the 1/2" gas valve is pushed back by gas pressure away from the 3/8" orifice which is sealed by the 1/2" gas valve. If the threaded end of the remote fire gas gun is held upward, oil can be dropped into the discharge tube. The oil will flow down the discharge tube into the inner parts of the gun and lubricate the 1/2" gas valve and the two o-rings. Approximately 20 drops of oil should be dropped into the discharge tube to insure that the gas valve is properly lubricated. After lubricating the 1/2" gas valve, charge the gas gun to 200 PSI and fire the gas gun. Repeat charging and firing the gas gun several times. The acoustic pulse from the gas gun should sound sharp. The gun should be tested for proper operation by shooting the gas gun into the atmosphere anytime the operation of the gas gun is questionable. Sand, debris, water vapor and other materials in the well must not be allowed to enter the Remote Fire Gas Gun inner parts. 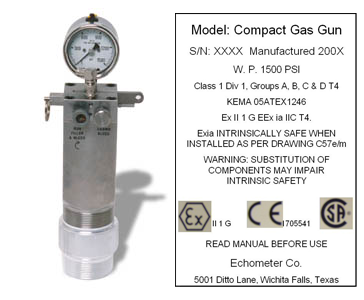 If debris is allowed to enter the gas gun, the small dart valve will leak gas from the small 1/8" opening beside the pressure gauge and cause improper operation. The gas gun may require disassembly to remove the debris and clean the gas gun. The Remote Fire Gas Gun should be charged to a pressure in excess of well pressure before the casing valve is opened to prevent sand, debris and water vapor from entering the inner parts of the gas gun. This well greatly reduce gas gun maintenance and result in better gas gun performance. What are the pros and cons for using a hydrocarbon gas from a nearby well for generating the initial pulse? What gas should be used for pressure transient testing? What gas cylinders are available for charging the gas guns? What are the uses of the pressure regulator? What are the considerations for use of the acoustic liquid level instruments in a hazardous environment? Intrinsically safe products and systems are certified or approved as safe by various agencies. The same agencies also approve explosion-proof devices, enclosures and accessories. The ATEX Certified Compact Gas Gun and the ATEX Certified 5000 PSI Gas Gun are approved for use in hazardous areas. These guns have been modified, as shown by the engraving, with special microphones for use in hazardous areas. The Remote Fire Gas Gun utilizes a solenoid for opening the gas valve. The power source required to activate the solenoid is supplied from the battery of either the Well Analyzer or the Model M strip chart recorder. For this reason, the Remote Fire Gas Gun is not suitable for use in hazardous conditions. Some older liquid level guns use a black powder blank that generates an acoustic pulse. The detonation of black powder creates a high temperature explosion, which could detonate a hazardous mixture. The blank guns are not recommended for use in hazardous locations. Gas guns are preferred to blank guns for almost all operations. The ATEX Certified Model M Acoustic Fluid Level Instrument has been modified, as shown by the engraving, to include safety circuits to limit electrical energy output in the event of a component malfunction. The Model M must be used in conjunction with an ATEX certified manual gas gun and must be installed in a safe area. The ATEX Certified Model E Well Analyzer has been modified, as shown by the engraving, to include safety circuits and barriers to limit electrical energy output in the event of a component malfunction. The Model E Well Analyzer must be used in conjunction with an ATEX certified manually fired gas gun and must be installed in a safe area. The Model H is itself an Intrinsically Safe fluid level instrument. It is both ATEX and IECEx certified. When installed and used in accordance with instructions it is designed for operation in hazardous environments. The Model H must be used in conjunction with an ATEX certified manual gas gun and must be installed as per drawing X57H. How are the 50k load cell washers and spacer installed on a pumping unit? How are the 50k (5") horseshoe transducer and hydraulic jack installed into the spool assembly to perform a dynamometer test? The advantage of the 50k (5") horseshoe transducer hydraulic jack assembly is that the polished rod is raised less than ¼" during installation of the load cell. 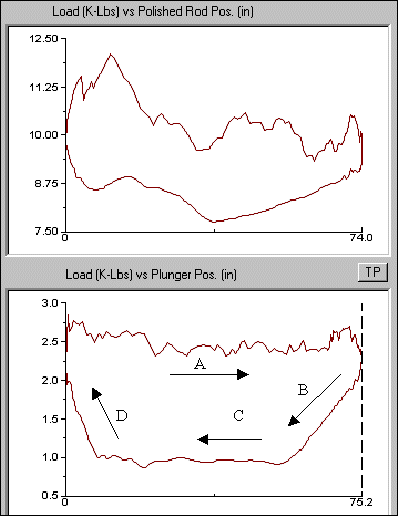 Thus, the pump plunder is located in the same position in the pump when the dynamometer test is performed. Also, the installation of the 50k horseshoe transducer (using the hydraulic jack) is easier and safer than installation of a 30k horseshoe transducer, which requires separating the pumping unit carrier bar from the permanent polished rod clamp a sufficient distance (3 inches) so that the horseshoe transducer can be inserted between the carrier bar and the clamp. The disadvantage of the 50k (5") horseshoe transducer hydraulic jack assembly is that a spool must be placed over the polished rod between the pumping unit carrier bar and the permanent polished rod clamp. 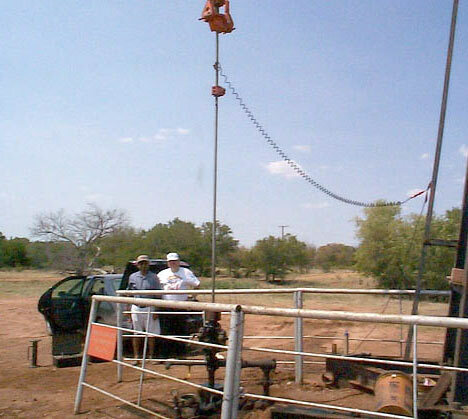 Normally, this spool is permanently installed on the well, requiring a spool for each well. What are the resistance values for the Pressure Transducers? Resistance to ground should be infinite on all pins. *Resistance will vary depending on pressure transducer temperature. Resistance value given is for 72°F. Resistance varies from 29.5K Ohms @ 0°F to 4.03K Ohms @ 120°F. 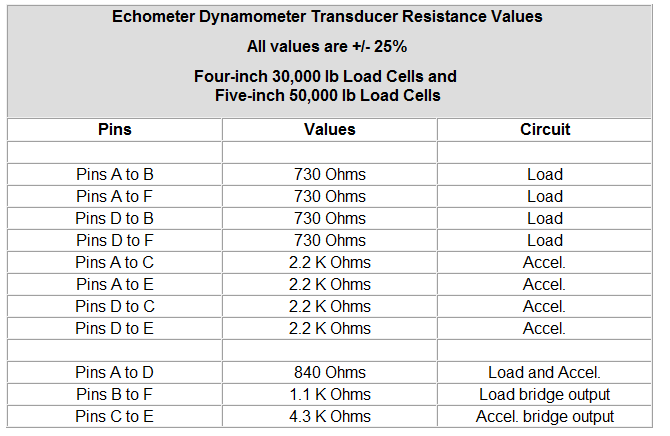 What are the resistance values for the Horseshoe Transducers? Load Cells with serial numbers HT137 through HT508 had pin "D" grounded to case when manufactured. The grounding wire from pin "D" to case was removed if the transducer has been service by Echometer Company. What is a safe way to support the dynamometer cable during pumping unit operation and dynamometer data acquisition? The dynamometer cable can become tangled in wellhead connections as the pumping unit polished rod and load cell travel up and down. The dynamometer cable attaching the load cell to the data acquisition box should be protected from becoming entangled with wellhead connections by supporting the cable in such a manner that the cable will not be caught by wellhead connections during polished rod movement. In the picture example below, one end of the coiled dynamometer cable is connected to the transducer. The other end of the coiled cable is attached to a 25 foot (dynamometer or straight) cable which has been looped midway up the ladder. The far end of this extension cable is attached to the Well Analyzer. This setup is a safe way to protect the dynamometer cable, the cable connectors and the connector on the horseshoe and polished rod transducers. It is also suggested that the first loop of the coiled cable connected to the transducer be either looped around the handle of the horseshoe load cell, or the adjustment handle of the polished rod transducer. This will further protect the connectors on the instruments. How should the dynamometer coiled cable be attached to the Polished Rod Transducer? The dynamometer coiled cable can vibrate loose from the polished rod transducer connector as the polished rod travels up and down. Also a side load caused by the coiled cable pulling on the polished rod transducer can affect the transducer's output. After attaching the coiled cable to the polished rod transducer, loop the coiled cable around the adjusting handle as shown in the picture. This will prevent the cable connector from pulling out of the transducer connector and also reduce side loading on the transducer. What are some things I can do to extend the battery life of the Model D, M and E 12 Volt batteries? The batteries used in the Model D, Model M and Model E equipment are rechargeable lead-acid batteries. These batteries can potentially last a number of years if they are properly handled, stored and charged. Charge before using. It will not damage these lead-acid batteries to leave them on charge for an extended period of time. Read your equipment manual for charging instructions. Use only the charger that comes with your equipment. Do not short circuit battery terminals; this may cause severe damage to the battery. Keep batteries away from fire and do not incinerate... they may explode. Under no circumstance should you attempt to open the battery case. Do not drop, hit or abuse battery. it may break and release electrolyte, which is corrosive. 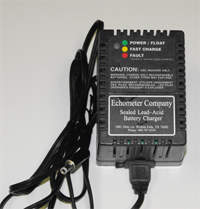 The AC charger supplied by Echometer can be connected indefinitely to the lead-acid battery because the charge mode changes to a trickle-charge state as the battery becomes fully charged. If the Well Analyzer is not being used for an extended period of time the AC charger should be left connected to achieve maximum battery life. The battery will become warm during charging and discharging. The life of the battery under normal conditions may be as long as 1,000 charge-discharge cycles. New batteries may require four or five charge-discharge cycles before they achieve their design capacity. It is normal for a battery to "self-discharge" during storage. Always fully charge the battery before you use it after it has been stored for over one week. For the battery used in the computer, follow the procedure recommended by the computer manufacturer. Will the Well Analyzer charger also charge the laptop? 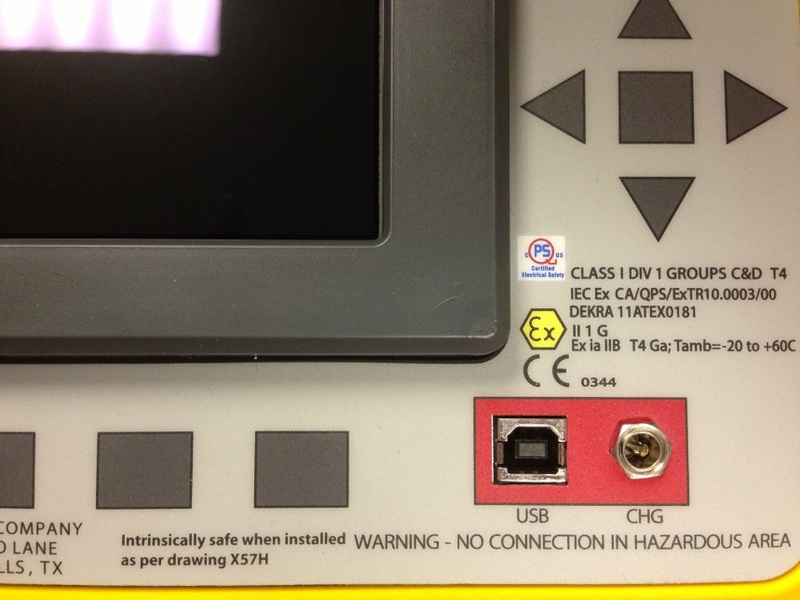 The wall charger for the Well Analyzer will not charge the laptop computer battery. When not in use, the computer and Well Analyzer batteries should be recharged fully using the corresponding chargers: 1) the well analyzer wall charger for the Well Analyzer and 2) the laptop battery charger for the computer. The only cable that will simultaneously charge both the Well Analyzer and the laptop is the auto cable that plugs into the cigarette lighter, and the right side of the Well Analyzer. In order for the charge to reach the laptop battery, it is necessary to plug the auto adapter, located in the back of the Well Analyzer case, into the charger plug on the laptop. By this means, even if the Well Analyzer battery is completely dead, the Well Analyzer and the laptop can still be used while out in the field. 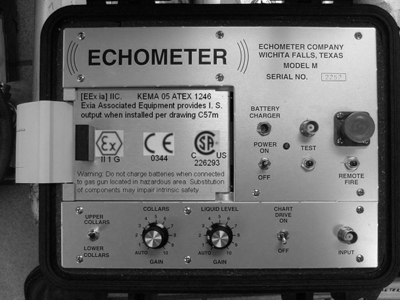 If the Well Analyzer battery is no longer good, please contact Echometer Company to order a new one. What are some signs that I may have a bad battery? When the Well Analyzer is first turned on, the Battery OK light should come on. If this light does not turn on, make sure the battery is properly connected. If the Battery OK light still does not come on this could mean that you have a bad battery, or that the battery had been left on the shelf long enough to self-discharge. Remove the battery and use a voltmeter to test the voltage of the battery. A healthy battery should show between 10.5 and 14 volts. If the battery voltage is less than 10.5 volts, there will not be enough voltage to power the analyzer and the battery must be put on charge until it is completely charged. If lead-acid batteries are continually used in a depleted state, the lead plates will begin to sulfate. When this happens, the battery will physically lose the capacity to hold a charge. This will become evident if you notice that the battery fully charges in a short time period (45mi - 1.5 hrs). This means the battery is damaged due to sulfation and must be replaced. Battery sits without charge for extended period of time. Leads to sulfation. Undercharging - Continuously operating a battery in a partial state of charge or storing the battery in a discharged state leads to sulfation. Quick charge time - Indicates sulfation has occurred to the extent that the battery has lost its capacity to hold a charge. Always fully charge the battery before you use it after it has been stored for over one week. What type of charger should I use to charge the Well Analyzer? 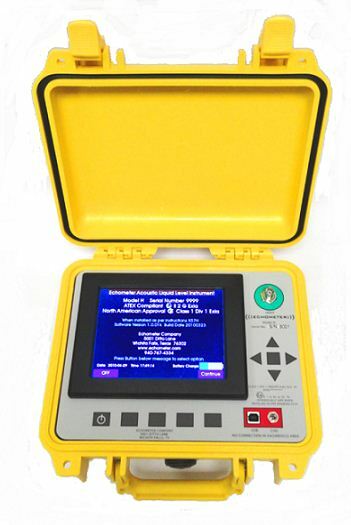 Echometer Company currently has two types of chargers in use with the Echometer Well Analyzer. The first is the Smart Battery Charger (3P10-A1015). This charger is currently being sold by Echometer Company. 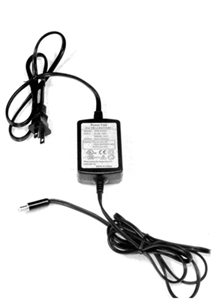 The second is an older model charger HPX10 Sealed Lead-Acid Battery Charger. Either charger can be used with the Echometer Well Analyzer. For more information, please read below. What are some general precautions I should take when using CO2 gas to fill the gas gun? Keep your CO2 bottle cool, away from direct sunlight, fire, radiators, etc. Don't leave bottles inside your automobile on hot days. Even though CO2 bottles have safety valves, it doesn't make sense to press your luck. Don't try to fill your own bottle unless you are qualified to do so. If you have to ignore this precaution, at least remember to never overfill a bottle beyond its rated capacity. Don't try to fill a bottle without an accurate weighing scale. Filling a bottle "by ear" is only for experts. Don't install or remove valves, etc. unless you are qualified to do so. Over tightening fittings can be extremely dangerous because they may be weakened enough to break below the burst pressure of the safety valve. What's the pressure in a CO2 tank? As long as there is liquid in the tank, the pressure in a CO2 tank is determined ONLY by the temperature. At room temperature (70 degrees F) it is about 853 psi. Once all the liquid is used up, there's only gas in the bottle, and then pressure drops pretty quickly. 88 degrees F is the critical point for CO2, where all the liquid evaporates no matter what (kind of complicated). Above 88 degrees, the pressure depends on bottle volume again, but this is not too important since bottles should never get this warm. How much liquid is in a "full" tank? Why not fill it up? A "full" tank contains about 34% liquid CO2. If it is filled any more, the CO2 will become very sensitive to temperature changes, with a small increase in temperature causing a large increase in pressure. This is a dangerous situation which is avoided by only partially filling the CO2 bottle. One cubic inch of water weighs 0.577 oz and the specific gravity of liquid CO2 is 1.977 gm/cc so one ounce of liquid CO2 has a volume of 0.877 cubic inches. CO2 bottles generally have a full-fill to volume ratio of about 2.57 cubic inches per ounce of CO2, so that one ounce of CO2 will take up 0.877/2.57 = 34% of the total volume of the bottle. The figure of 68% is often quoted as the volume of liquid in a full bottle, but this error probably stems from translating "ounce" into volume using water as the standard. Water is 1.00 gm/cc, or about half the density of liquid CO2 so that if a CO2 bottle is filled to its rated capacity with water, it will be 68% liquid by volume. Why does my gun have problems in cold weather? Because the pressure of the CO2 in your tank is lower for lower temperatures, when it gets cold, there's not enough pressure in the tank to make your gun operate properly. For some guns, which run well on liquid, a "siphon" tube can be installed in the tank. This is a tube that extends into the liquid in your tank, and the pressure of the CO2 in the tank always forces liquid into the gun. These kinds of guns work well in the cold weather. Others, like the Automag, cannot stand to have liquid in them, and usually one needs to have an "anti-siphon" tube in the tank that makes sure that only gas is fed to the gun. These kinds of guns are most sensitive to temperature, because they feed on the gas directly. Why do they chill the bottle before filling it? CO2 tanks are usually filled from a "bulk tank". These tanks have siphon tubes which extend down into the liquid of the tank, and when you open the valve on the bulk tank, the pressure in the tank will force liquid out of the valve. The problem is, once you force a little bit of liquid into the gun bottle, it will evaporate and raise the pressure in the gun bottle to the same as the bulk bottle, and no more liquid can flow into the gun bottle. In order to fill the gun bottle, it must be at a lower pressure than the bulk bottle, and since its only the temperature that determines the pressure, you have to lower the temperature of the gun bottle below that of the bulk bottle. This is done by either putting the gun bottle in a freezer (if you have time), or by blowing off some liquid that is already in the gun bottle. This works because evaporation is a cooling effect. CO2 bottles contain copper "burst disks" which will blow out above a certain pressure and release the contents of the bottle into the air in a relatively safe manner. The blowout pressure of burst discs vary with manufacturer but the minimum value is about 2200 psi and the maximum value is about 2800 psi. How much should I under fill my bottle on hot days? Referring to the graph, you can see that even for a bottle that is filled to 100% of rated fill, overpressure should not be a problem. Nevertheless, it is probably wise to try to stay under 1500 psi. On really hot days where you can't prevent the sun from raising the temperature of the bottle beyond 100 degrees Fahrenheit filling to 80% is a good idea. Why does the bottle get cold after several shots in a row? There is usually both liquid and gas in the CO2 bottle. When the gun is fired, some gas is drawn out of the bottle. The remaining liquid evaporates to restore the pressure in the bottle, and just as water evaporating from your skin cools you off, the CO2 evaporating from the liquid in the bottle cools off the whole bottle, liquid, gas, and all. The molecules of the liquid CO2 are in constant motion, some moving faster than average, some moving slower. The average speed of the molecules is related to temperature, the higher the temperature, the faster they move, on average. However, when molecules evaporate from a liquid, it is only the faster "hot" molecules that can jump into the gas phase. They lose some of their speed breaking away from the liquid, but the liquid that is left behind is colder than it was because it lost its "hot" molecules to the gas. Specific Gravity of CO2 is 1.977 gm/cc Thus the weight of 1 cu inch of liquid CO2 is 1.140 oz. What steps should I take to fill a CO2 bottle? What steps should I take to fill a N2 bottle? What are the best cleaners to use when cleaning equipment after use or when performing routine maintenance on equipment? Certain areas of equipment require special treatment, and therefore please consult the corresponding links to the type of equipment preventive maintenance you are performing. My laptop continuously shuts down after a short period of time when it is running on battery power. How can I turn off this power save so that I can continue acquiring data without interruption? The following example explains turning off the USB power save option in Windows XP, but you would follow the same type of instruction for any other version of Windows. 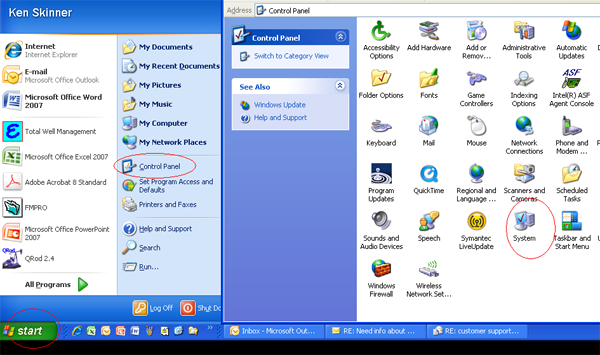 In Windows, click on Start > Control Panel (or Start > Settings > Control Panel). 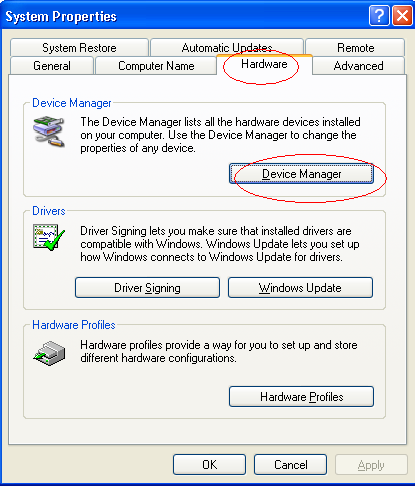 Click on the Hardware Tab then select Device Manager. 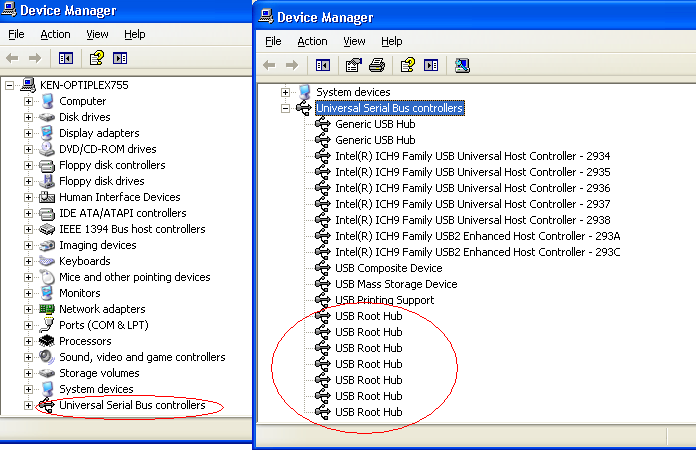 From the Device Manager, click the + next to Universal Serial Bus Controllers. 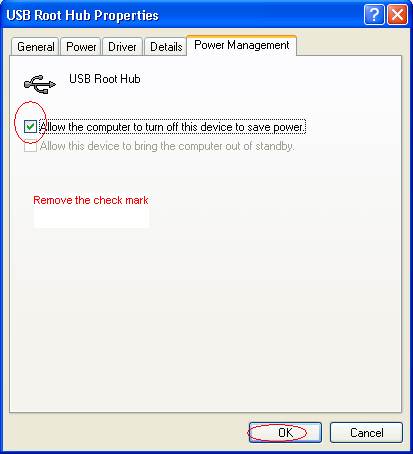 Clear the checkmark from Allow the computer to turn off this device to save power and click OK.
Repeat this procedure for all of the USB Root Hubs. What should I use to test the voltage on the power box before installing the power probe? Echometer Company encourages safety in all aspects of our equipment installation. It is ALWAYS recommended to check the voltage on the power box and control panel BEFORE installing the power probe. One brand of voltage tester used is the VoltAlertT. Click on the following link to download a PDF version of the product information. Echometer Company does not sell voltage testers. Contact a voltage reader retailer for purchase. How useful were these questions? Let us know here.